A.J. Brown does a great job writing A Stitch of Madness. This book is a quick read! I read it in one sitting. 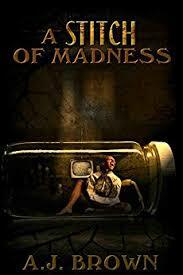 This book consists of three short stories that are based on the theme of madness. In the first story is about a man who may have been driven to madness by an old urban legend. The second story is about a girl who owns a rag doll that may contain the spirit of her dead mother. The last story is about a man who may have been visited by the devil. The first story deals with loyalty between two friends. The second story deals with abuse. The last story deals with grapes. Overall, I liked this anthology, but the stories could have been re-arranged to better impact the reader. My favorite story out of the three is the first one; therefore, I think it should have been placed third because it would have allowed the book to end on a high note. The second story should stay where it is, but the third story should go first. The anthology set up is good the way it is because the story about the urban legend hooks you from the beginning and doesn’t let you go. I will definitely read A.J. Brown’s other work.